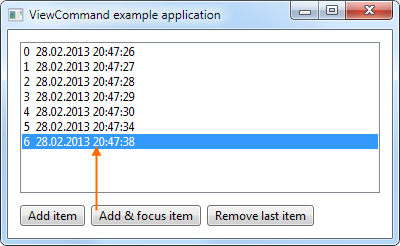 In WPF applications following the MVVM design pattern, it’s not easy to control the View from a ViewModel class. Theoretically it should not be possible at all. But as you know, in practice this doesn’t always work. So similar to the Command pattern letting a View control its ViewModel, I’m propsing the ViewCommand pattern that works in the opposite direction, while maintaining the loose coupling of View and ViewModel. Created on 2014-02-01, updated on 2016-05-20.